If you haven’t been keeping up with Norah Jones’ career, then the premise of her new album, …Featuring, may surprise you a little. While she’s mostly known for her lulling voice and jazzy piano playing, Norah has shown time and time again that she is comfortable in a variety of genres and can hold her own with a variety of musicians. …Featuring gives a nice overview of some of Norah’s collaborative efforts with other artists over the years and it does a good job of showcasing her unique stamp that she brings to each project. Due to the nature of the record, the vibe of …Featuring covers a wide stretch of the musical spectrum, with Norah’s voice and piano playing acting as the unifying thread. While this may be distracting for some, it actually speaks volumes to her unique ability to find herself within any musical mood and she plays to her strengths in each setting. One sign of a true musician is their desire to enter into a conversation with the musicians around them to do what’s best for the song. So whether that means she’s simply blending trio vocals (“Loretta”) or laying down some jaw-dropping virtuoso jazz piano licks (“Court and Spark”), she does her part to elevate the song without overshadowing anyone. Besides, not many folks get invited to play with such diverse acts as Willie Nelson, Outkast and Foo Fighters, so she must be doing something right. The songs on …Featuring basically fall into one of three main categories. They are either from Norah’s main records, her side projects or her appearances on other artist’s albums. Her main body of work is represented by “Creepin’ In” with Dolly Parton from Feels Like Home, “Blue Bayou” with M. Ward from her Live in Austin, TX DVD and “Loretta” with Gillian Welch and David Rawlings from her Live in 2004 DVD. Both of her side projects are on display as well with “”Love Me” from The Little Willies, and “The Best Part” from El Madmo. 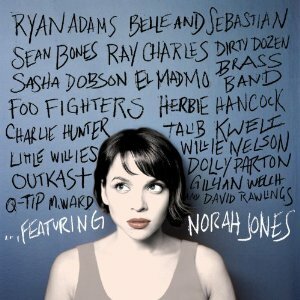 The rest of the songs are comprised of Norah’s guest spots on other records. These tracks show her diversity the most as she effortlessly slides into many different genres. For most, her forays into hip-hop will be the farthest stretch from what she’s known for, but the results are both interesting and impressive. She shines by bringing her relaxed confidence to “Life Is Better” with Q-Tip, “Turn Them” with Sean Bones, “Take Off Your Cool” with Andre 3000 of Outkast and “Soon The New Day” with Talib Kweli. If those tracks aren’t your preference though, there’s plenty more of what her fans have come to love her for. She gets twangy on “Baby It’s Cold Outside” with Willie Nelson, “Dear John” with Ryan Adams and “Bull Rider” with Sasha Dobson. She gets jazzy on “Here We Go Again” with Ray Charles, “Court and Spark” with Herbie Hancock, “More Than This” with Charlie Hunter and “Ruler of My Heart” with The Dirty Dozen Brass Band. She even hangs out with some of her rock friends on “Little Lou, Ugly Jack, Prophet John” with Belle & Sebastian and “Virginia Moon” with Foo Fighters. While …Featuring absolutely has a compilation mixtape feel to it, Norah’s presence is strong enough in each track to still give the album cohesion. For the most part, it makes a strong case for Norah being one of the most talented, unafraid and sought after musical chameleons around. While there is a vast amount of impressive musical collaborations involving Norah Jones out there to be heard if you look hard enough, …Featuring combines enough of them into one package to be a great place to start.